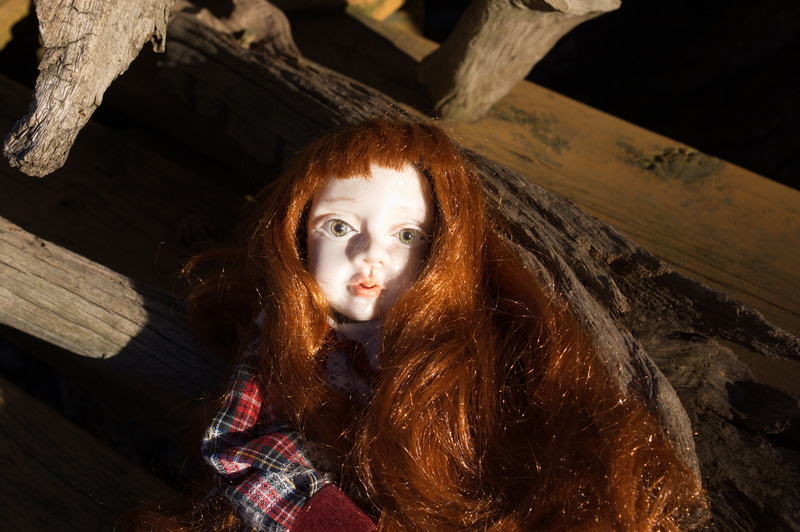 I made this doll out of polymer clay, with acrylic eyes and fake eyelashes, and a wig from a used porcelain doll. She was painted with chalk pastels. 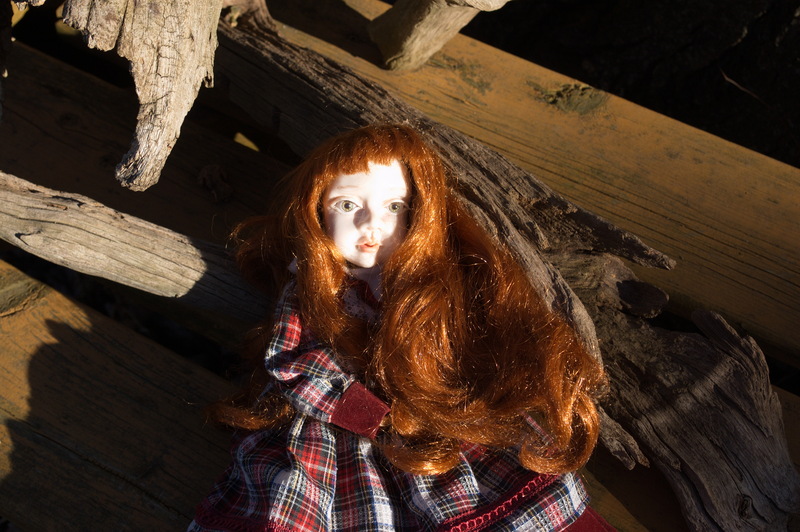 Now to figure out how to make proper doll bodies! 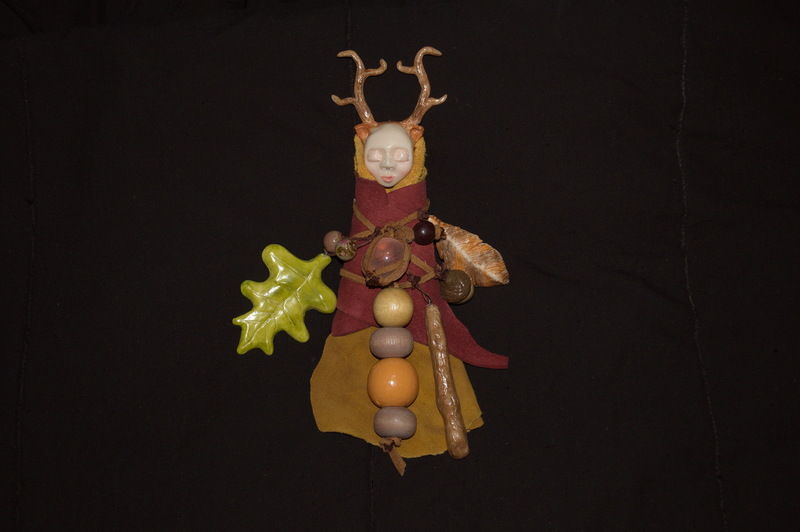 Here is another goddess doll I sculpted, and I’ve been working hard to get the facial details right. Sculpting takes a lot of practice, but it’s great fun too. 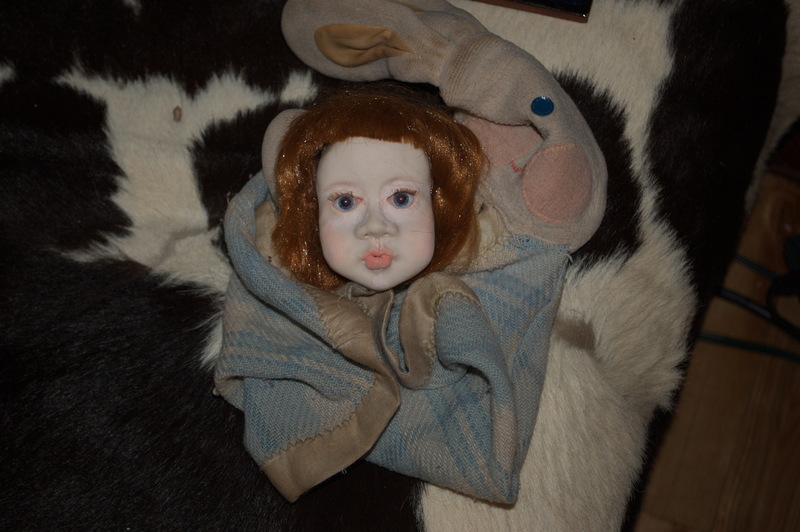 This doll has blue eyes, fake eyelashes, and is coloured with chalk pastels. 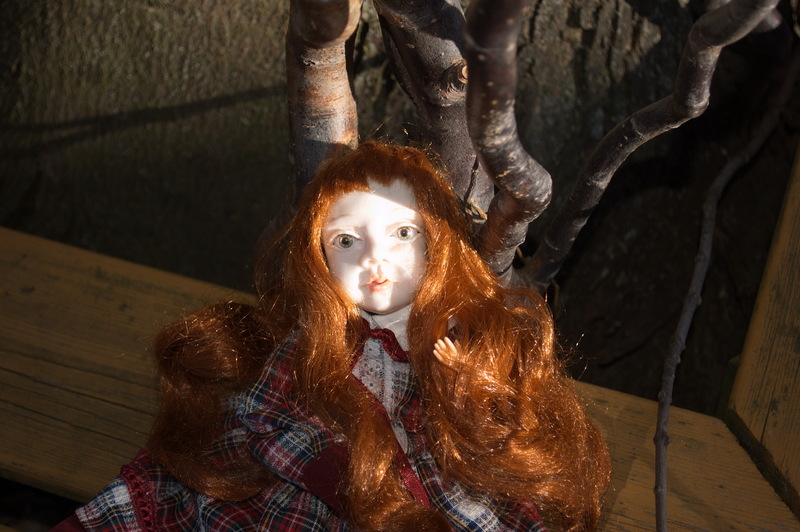 The body is made of deerskin and lace fabric. 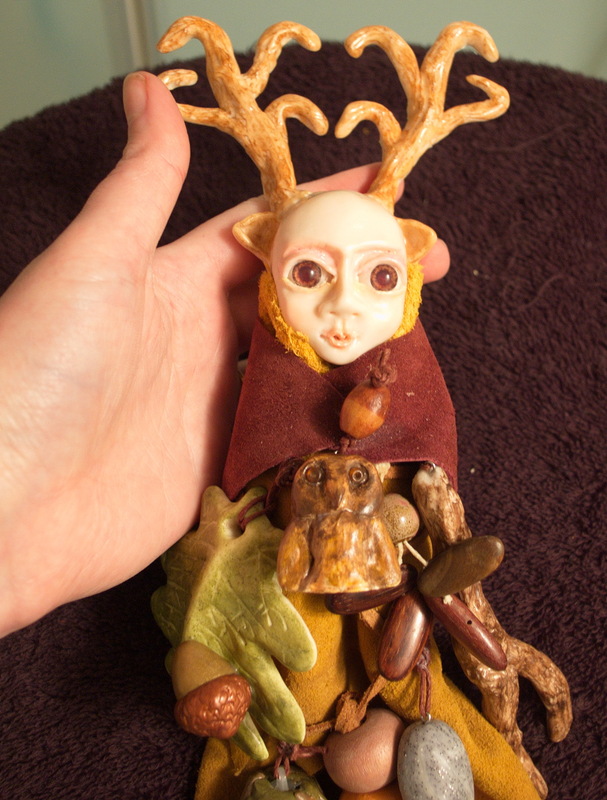 She comes with several polymer clay charms: an owl, an acorn, an oak leaf, and a tree branch. I sculpted this one with open eyes. 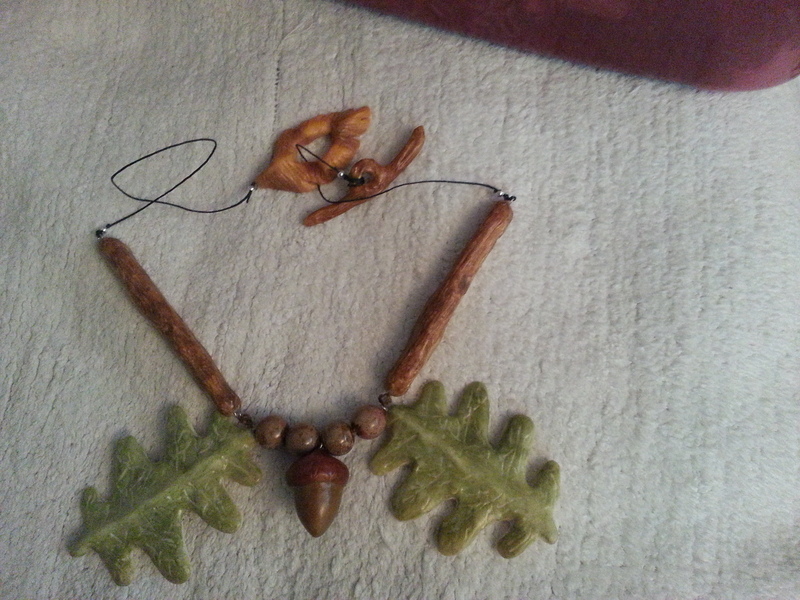 She has a cute owl charm, an oak leaf and acorn, a tree branch, a pebble, and a tiny glass bottle with blue bird eggs. Love oak trees? 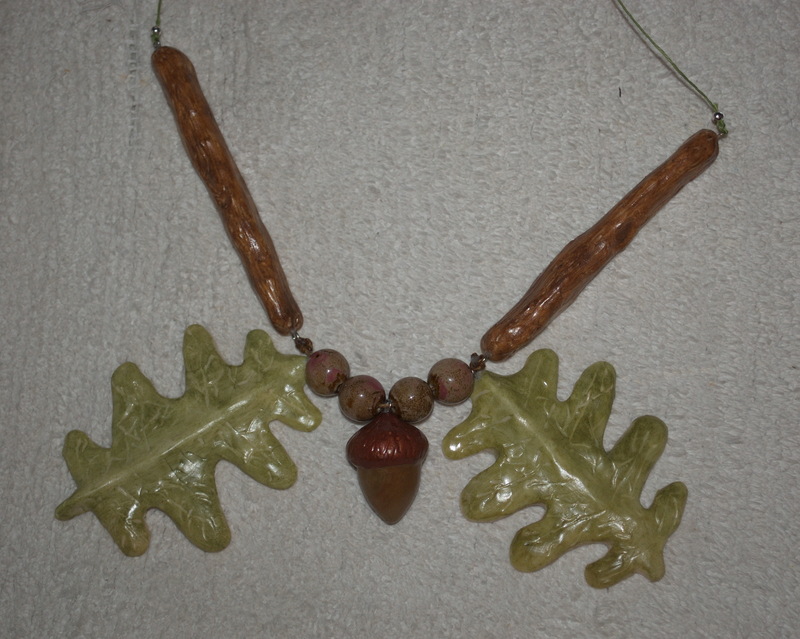 Then this is the necklace for you! See it on Etsy. 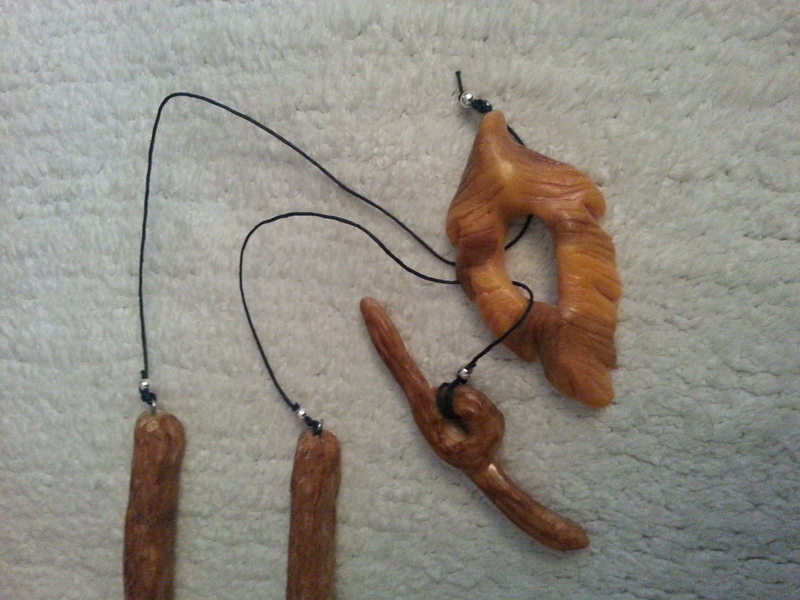 My Etsy shop has more polymer clay creations! 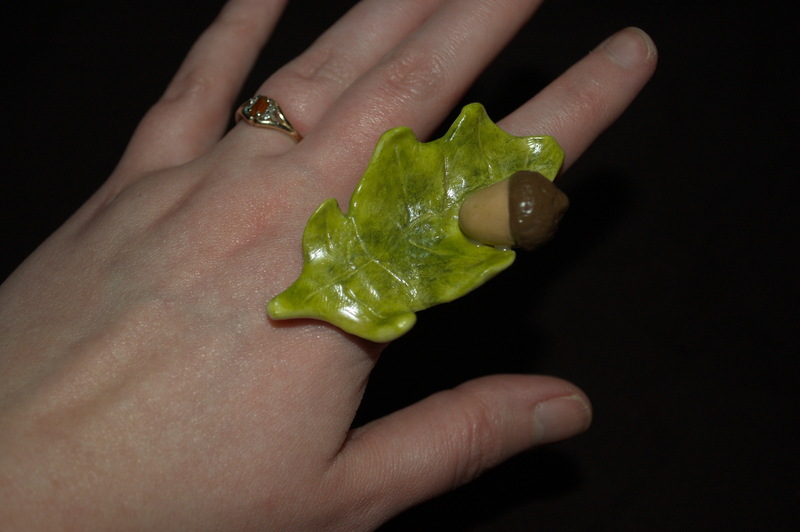 This is a ring made of polymer clay, mounted on a gold tone ring base. 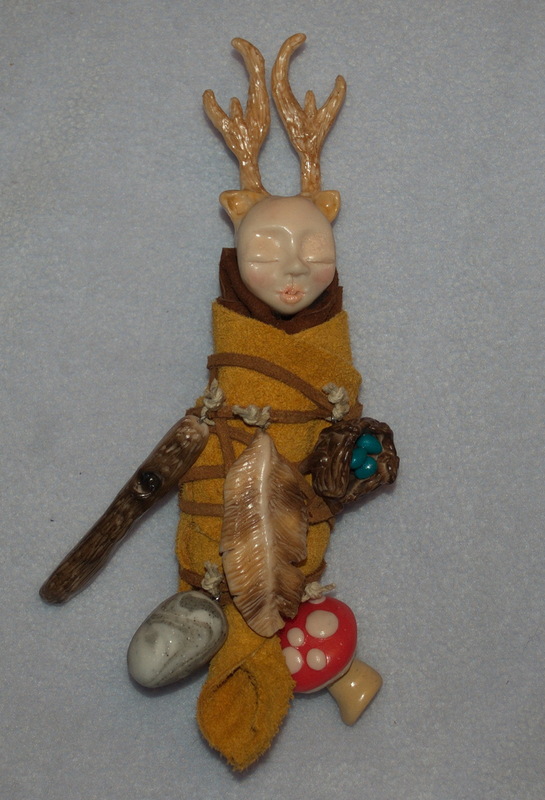 Here’s another sleeping goddess doll. 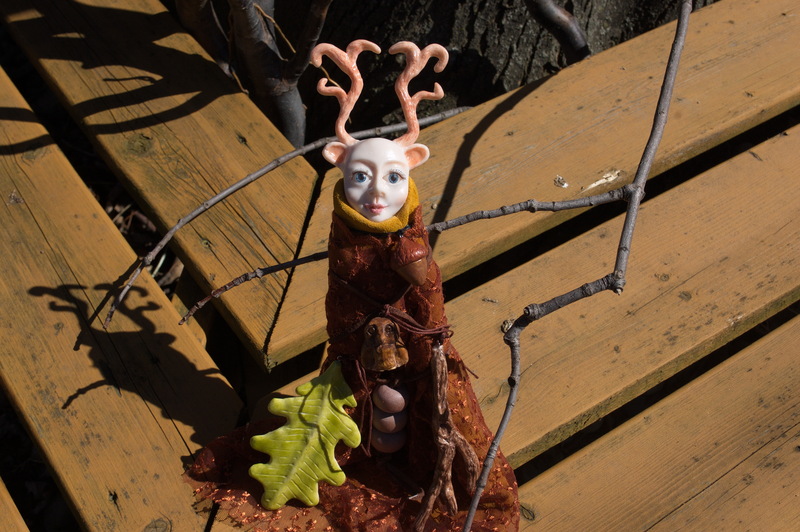 This one has fantasy antlers and a real rose quartz sphere. I’m working with new techniques for doing faces, and I love getting completely absorbed in detailed sculpting! 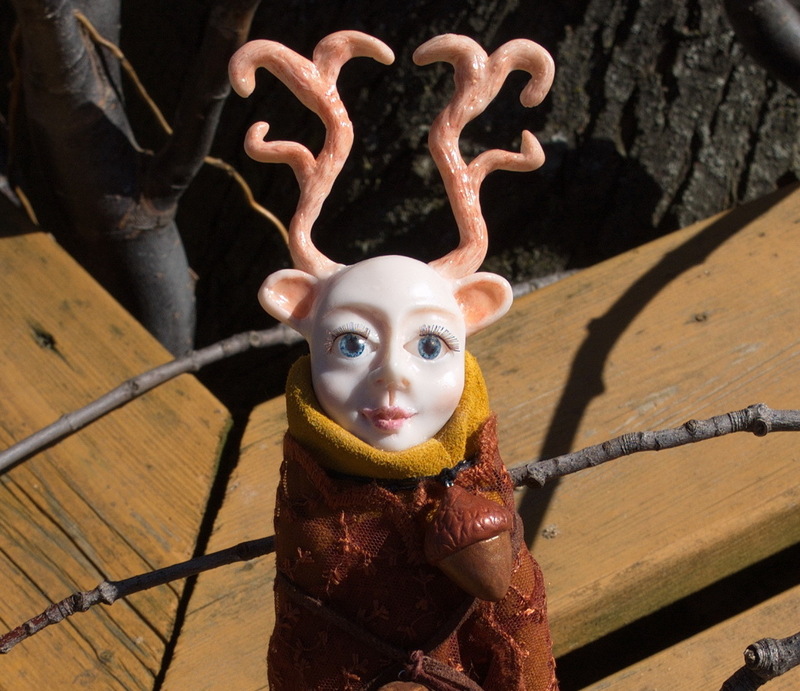 This doll is bundled up in leather with polymer clay nature charms.